Happy Hump Day!!! With Spring finally here, it will only be a matter of weeks or even days for some of you before we all start grabbing for that white sundress or those denim shorts instead of our sweaters. It's already reached the 90s a couple of times here in Dallas, so my sundresses are ready to go! Another sign that Spring is here is the introduction of bright colors! 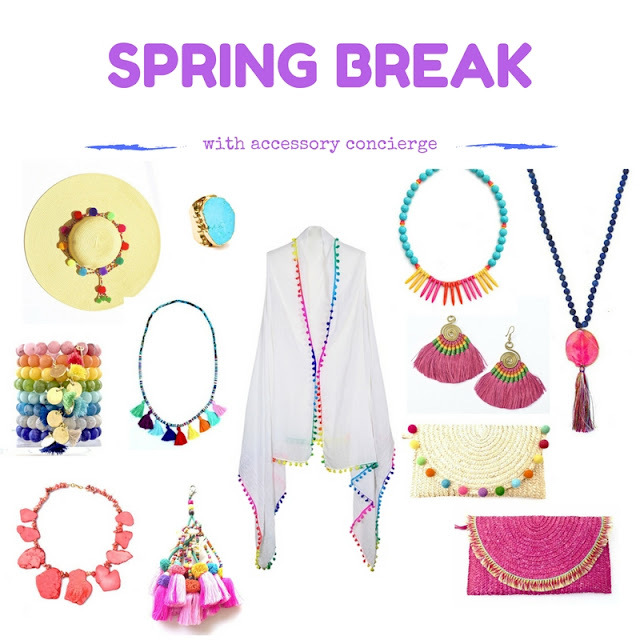 Whether you're a jeans and a white tee gal or a sundress girl, you can invite Spring into your wardrobe by adding a fun pair of Fiesta Fringe Drops or a big turquoise necklace. One of the easiest ways to add a statement to your outfit thought is by adding a fun clutch! Luckily for you, bold, bright, fun clutches are everywhere and you don't even have to break the bank getting one! We've listed out our favorite Spring clutches below, but would love to hear what your favorites are. We'd also love to know how you make a fashion statement! Feel free to share in the comments. Happy Monday!! I hope you all had a great weekend! When porches start to get crowded, the trees start blooming, and sandals become a wardrobe staple, you know that Spring is officially here! With Spring comes new trends and some of the best trends this season involve jeans. The denim trends for Spring are so varied that you're bound to find one that fits your personal style. The biggest denim trends right now are wide leg jean, bootcut denim, flares, cropped denim, distressed denim, uneven hems, frayed hems, and boyfriend or girlfriend jeans. There's so much to choose from! 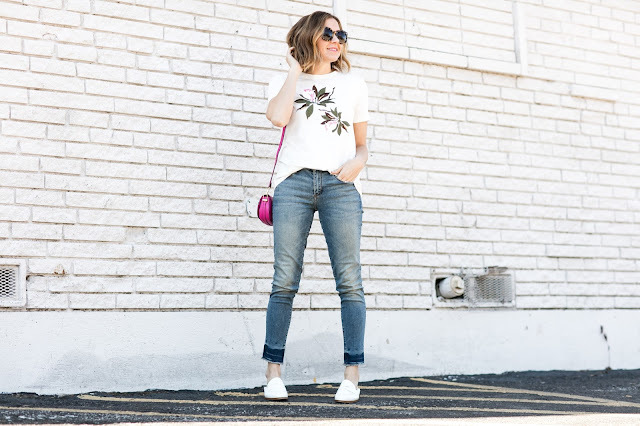 Whenever there are a lot of trends like there are in denim right now, some of which make more of a statement than others, I highly recommend going with those trends that flatter your body type. For example, being 5'2" with a short waistline, boyfriend jeans ten to swallow me up and make me look larger than I really am. While I think it's such a cute trend, it is just one that doesn't work for my body type. 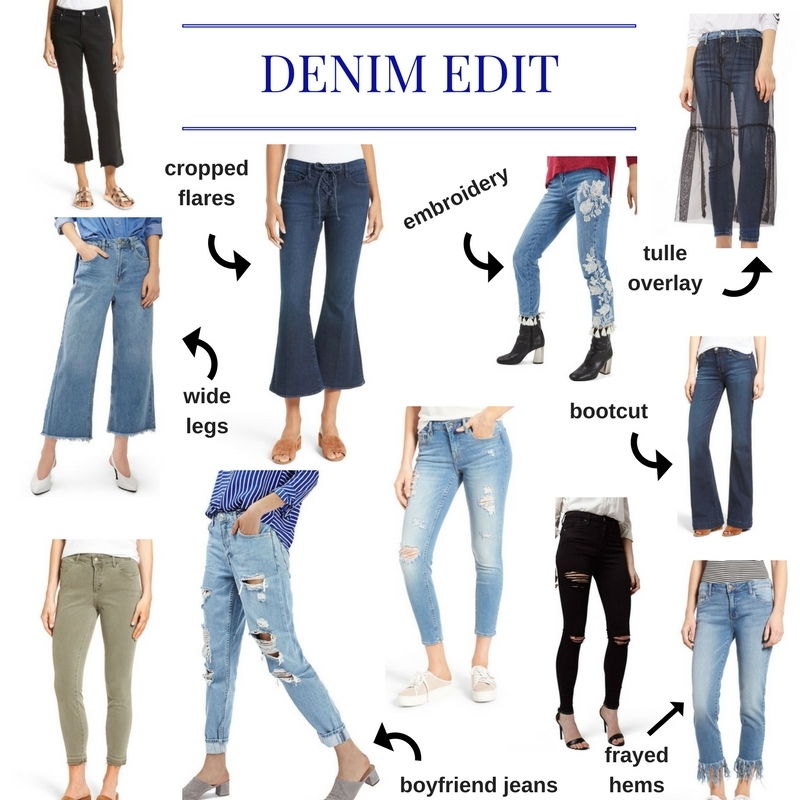 If you're not sure what type of denim works best for your body, check out this guide from Who What Wear - I found it super helpful! Happy Hump Day!! It's not every day you can find a dress for under $30 that can be worn in so many different ways. I stumbled across this dress a couple of weeks ago and couldn't wait to share it with you all!! The material is super soft and not see through at all, and lends itself to so many different styling options. I styled it pretty casually here with some basic white sandals and my go-to necklace as of late. Side not - this necklace is such a hit every time I wear it and goes with more colors than you might think - I highly recommend it! Anyway, I think this dress would be adorable with some cute wedges and a denim jacket, too. I also plan on taking it to the beach with me in a couple of weeks and wearing it as a coverup. How would you style this dress? What accessories would you pair with it? Would you carry a bold color clutch? Pink quarts earrings? A big stack of colorful bangles? We'd love to know how you'd style it!! Happy Monday!! I hope you all have had a giant cup of coffee and are ready to conquer your week! Can you believe today is the first official day of Spring!? I feel like there's really no better way to ring in the new season then to talk about one of Spring's biggest trends - embroidery! Embroidery is actually one of my favorite trends this season simply because it fits anyone and everyone's style. Embroidery is literally on everything - bags, tops, dresses, jeans, skirts, etc., which makes it so easy to pick and choose what embroidered item fits your style. 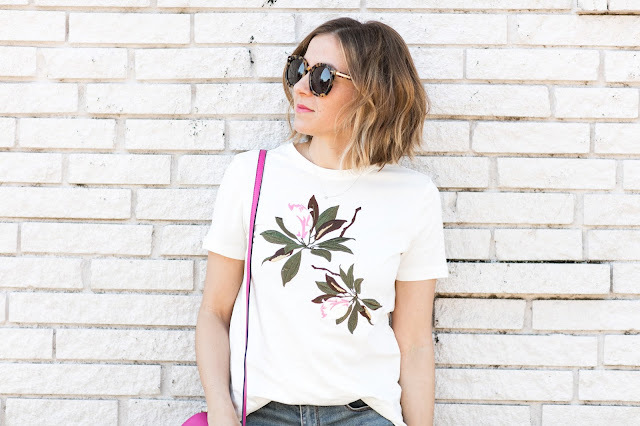 I opted for a casual embroidered tee as I'm usually running around town with my girls, but you could wear an embroidered dress, some embroidered denim, or even an embroidered collar shirt. It's so fun! Have you tried this trend yet? What's your favorite embroidered item? You can shop my favorite pics at the end of this post and each item is under $100!! Happy St. Patrick's Day!! I hope you're all wearing green and that you all have something extra fun planned for today! I'm not quite sure what our plans are yet, but I know it will involve a green milkshake at some point! Spring is just 3 days away and that means that we are in a full transition from our winter wardrobe and accessories to our spring/summer clothes and bright, new jewelry. Over the years I've found that one of the easiest ways to tolerate those warm days and cool nights is by wearing jeans and layering. As we shift into Spring we start to shift our denim, too. We go from dark to light denim, from black to white, and from polished skinny jeans that fit inside your over the knee boots to ripped denim that exposes a little leg! The fun thing about ripped denim is that you can literally style it any way you'd like. Accessorize it with heels or sandals, with stud earrings or trendy tassels, or a bold necklace! Who's ready for Spring Break? The temperatures keep creeping up in Dallas and it has us ready and excited to escape to the beach! Whether you're in college, traveling as a family, or simply getting out of dodge with some friends, beach vacations are on the horizon! One of my favorite things about packing for a trip to the beach is not what I'm going to bring to wear at night, but what I'll be wearing around the pool! Poolside accessories are so fun and full of color, and this year's tassel and pom pom trends give pool accessories a new pizzaz! I based today's beach look all around this adorable convertible pom pom scarf. If you haven't seen this scarf let, let me introduce you to your favorite poolside accessory. It can be worn as a coverup or wrapped up to be worn like a scarf. It's light weight, comfortable, and flattering for any body type. The rainbow colored pom pom trim allows you to accessorize your jewelry and bag any way you'd like. The fact that you can style this coverup in so many different ways is my favorite part because it is so easy to adapt this coverup to fit your personal style. I personally would pair this adorable coverup with the pink clutch pictured above, a fun tassel necklace, and the floppy hat above. How would you style yours? Happy Hump Day! Today we're focusing on one of the more feminine trends for this season - ruffles! No matter what your personal style is you can find a way to add ruffles to your wardrobe! 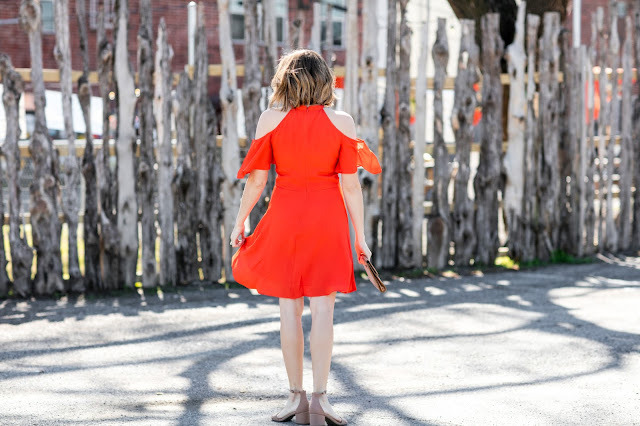 Whether it's a chic LBD with ruffles, ruffle detailing on your sleeves, or a romper with ruffle details, you can most definitely find something! For me, I wanted a top on the more casual side that I could dress down for running errands and playing with my 1 and 3 year old, and then dress up for date night simply by changing my shoes. I found this top a bit ago and knew it would fit the bill. A tee that is comfortable and on trend? Sign me up. The great thing about finding a more neutral ruffle piece like today's top is that you can change the look of it by the way you accessorize, too. I typically wear more dainty jewelry, but I think a bold necklace or some bright earrings would look amazing with this top! I've listed some of my favorite accessories for this top below! How would you style it? Happy Monday, guys! March officially kicks off Spring Breaks all around the country and even though I'm not in school any more, I am headed to the beach later this week! With beach on my mind I've been looking for dresses that I can wear here in Dallas and at the beach. I love this red dress from Asos for the bright colors and flirty feel. 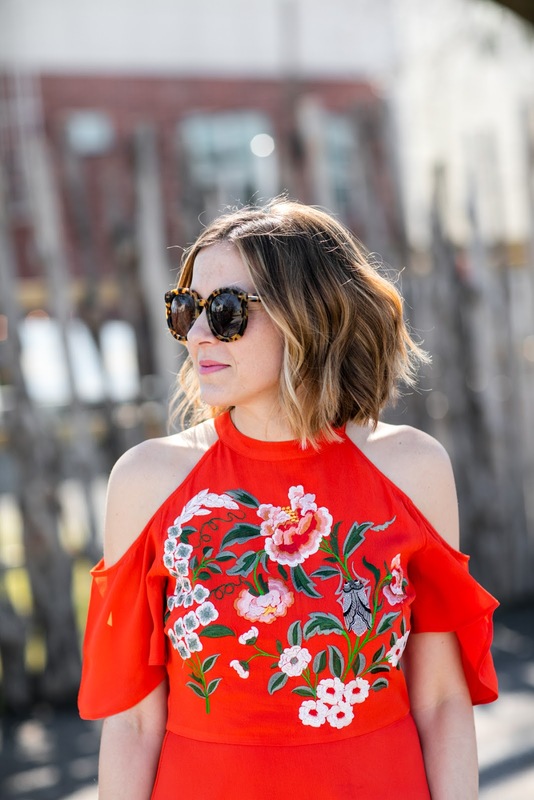 This dress also touches on several big trends right now - floral embroidery and cold shoulders, and the best part about this dress is that it's under $65! What are some of your favorite trends right now? We'd love to hear! Happy Friday, guys!! Can you believe it's March already? We can already tell March is going to be one of those months that's just full of fun - Easter, Spring Break, the beginning of Spring, and of course, St. Patrick's Day!! St. Patrick's Day is one of those holidays that always seems to sneak up on me. I feel like each year I stare into my closet when I wake up desperately trying to find one green item. This year though, I'm trying to be better prepared. 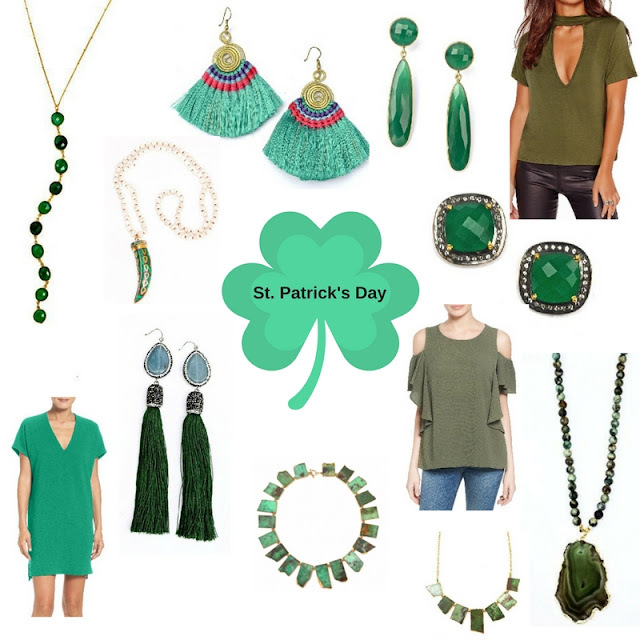 If you're not big on wearing green, one of the easiest ways to avoid being pinched but still celebrate the holiday is to wear green accessories! Shop our favorites below and let us know your favorite way to dress for the holiday!!! Happy Hump Day! Can you believe it's March already? I do have to admit that it has already started feeling like Spring here in Dallas with temperatures fluctuating all the way up into the 80s. I will admit though that I love dressing for transitional weather because it's so easy if you find the right piece. The easiest way to dress for cooler mornings and evenings and warmer temperatures during the day is to find the perfect dress. Take this dress for example, I styled it here with boots for cooler temperatures, but a simple switch into flats or wedges would be perfect for warm weather. Finding a dress like this one that's hints to spring with lace details or lighter colors makes it easy to wear in the end of Winter and the beginning of Spring.